Get into the nursing school of your choice and succeed once you get there!A Doody's Core Title for 2011! "This information-packed, 208-page book covers the essentials of entering nursing school....a valuable resource for the prospective nursing student. 3 Stars." 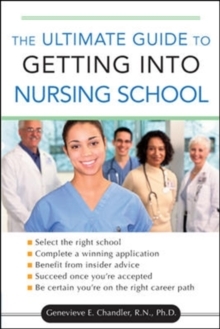 --Doody's Review ServiceIf getting into the right nursing school -- and making your mark -- is your goal, following the strategies in The Ultimate Guide to Getting into Nursing School will definitely put you ahead of the pack.